Mainstream project management practices are codified in various “bodies of knowledge” (BOKs) that serve as definitive guides or standards for the profession. This formalization of project management knowledge serves to propagate and legitimize practices regardless of their actual utility. 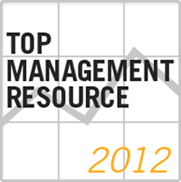 Moreover, it also leads to a perception that project management practices are domain-independent. In a recent paper entitled, 21st century project management = open source body of knowledge, Jon Whitty calls for an open source approach to the development and dissemination of project management knowledge, with a view to addressing the aforementioned limitations of the “BOK-centric” paradigm. This post summarises the main ideas presented in the paper. Why step outside the BOKs? Techniques that are easy to replicate (copy and pass on to others) have a greater chance of acceptance, regardless of whether they are useful or not. This point is discussed at length in my post on the memetic view of project management. Techniques that give project managers (and their managers) an emotional affect have a better chance of acceptance. See my post on emotional effect of project management artefacts for more on this. 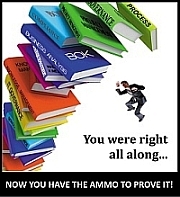 The main consequence of the above is that “standard” project management knowledge as embodied in books and BOKs isn’t necessarily a reflection of how project management is (or even, should be) practiced. Yet this is the official, authorized version of knowledge, used to train and certify project managers. Another point that I would add in support of Whitty’s arguments is that there is a difference between project management theory and project management practice (see this paper, for example). Projects are seldom, if ever, run by the book; it is a fact that most project managers do “think outside the BOKs” when practicing their profession. A body of knowledge reflecting how projects are actually run in practice would thus be very different from the prescriptions presented in books and BOKs. A bottom-up approach to project decision making, involving all stakeholders, rather than a top-down approach implicitly advocated by books and BOKs. The recognition that project management needs to be tailored to the needs of specific domains, rather than striving for the lowest common denominator of domain independent tools and techniques. An open source approach to project management knowledge whereby anyone can contribute techniques and case studies based on their own (possibly domain specific) experiences. A culture that enables project managers to report their specific practices (and failures) without fear of reprisals. New techniques can be shared and evaluated by practicing project managers and academics. Domain specific project management knowledge can be compiled, tested and disseminated. This knowledge will evolve as it is supported (or refuted) through case studies and other data contributed by practitioners. Obviously open source does not mean that anything goes; that would be a recipe for chaos and confusion. Oversight is needed to ensure that the repository is coherent and meaningful, and that contributed material meets certain quality standards. This is nothing new – most open source efforts operate this way already – Wikipedia being the closest in spirit to the one proposed by Whitty. The implications for an open source body of knowledge for project management will be significant for the current project management professional associations who control existing BOKs, particularly the PMI who hold the intellectual property to the current Guide. The PMI and others will need to abandon their ideals for creating a professional class of project managers. They could take a leadership role in the development and on‐going coordination of the human and technological mechanisms that develop and maintain the OS‐PMBOK and validate the source evidence of the various knowledge libraries. Their role might also be more like that of a vocational skills awarding body. As the various domain specific bodies of knowledge for project management emerge, the project management associations could have a place in developing and administering specific project management certification in conjunction with key industry bodies that represent the various domains. The project management associations will also need to establish new alliances with the academic community and lend support, cooperation, and channel industry funding towards evidence-based practice research. Many of the activities listed by Whitty are already carried out by most professional project management organisations. As I see it, these organisations would continue to play an important role in developing the profession. However, they would no longer be the arbiters of what is legitimate and what isn’t. Existing project management knowledge tells us how projects should be managed, not how they are actually managed. Seen in this light, Whitty’s proposal for an open source approach to project management makes eminent sense. Such an approach may lead to a body of knowledge that reflects the diverse ways in which project management is practiced in various (corporate and national) cultures and domains. Introduction – a dilemma resolved? 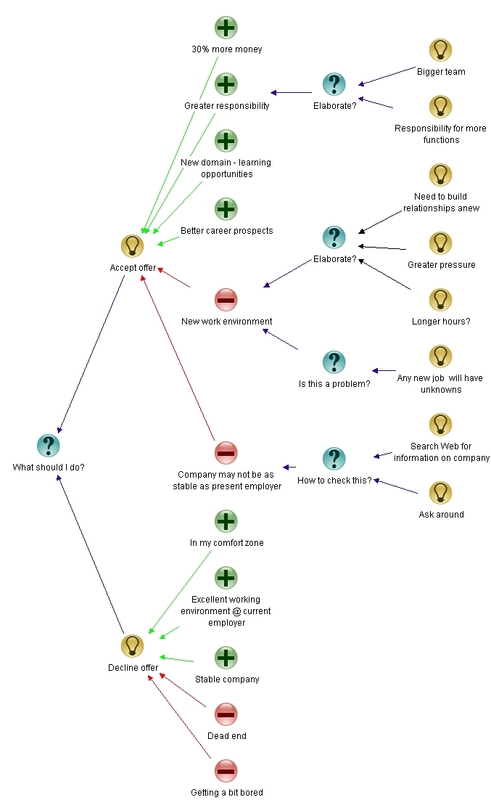 Last week I published a post about how a friend and I used the Issue-based Information System (IBIS) notation to map out a dilemma he was facing – whether to accept or decline a job offer. The final map of that discussion is reproduced in Figure 1 below. 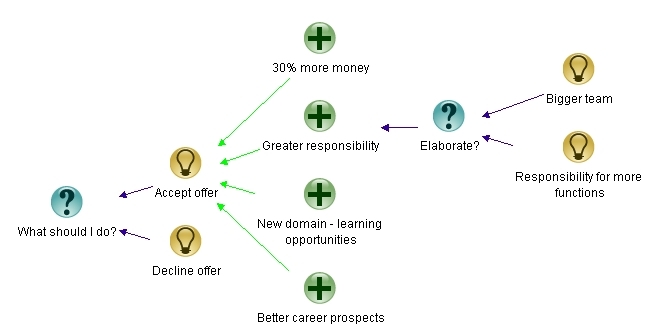 The map illustrates how we analysed the pros and cons of the options before him. As I’d mentioned in the post, a couple of days after we did the map, he called to tell me that he had accepted the offer. I was pleased that it had worked out for him and was pretty sure that the dilemma was essentially resolved: he’d accepted the job, so that was that. Last Saturday I happened to meet him again. Naturally, I asked him how things were going – how his current employer had reacted to his resignation etc. “Wow!” I couldn’t help interjecting. Wow, indeed – we couldn’t have anticipated this scenario… or could we? 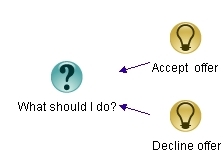 The options explored in the map (accept/decline) are in fact the same point – one is simply the negation of the other. So this should be represented as a single option (either accept or decline), with the pros arguing for the represented option and the cons arguing for the unrepresented one. Options other than the obvious one (accept or decline) should have been explored. In my response I pointed out that although representing the two options as separate points causes redundancies, it can help participants “see” arguments that may not be obvious immediately. One is drawn to consider each of the actions separately because they are both represented as distinct options, each with their own consequences (I’ll say more about this later in this post). The downside, as Tim mentions, is more clutter and superfluity. This is not necessarily a problem for small maps but can be an issue in larger ones. For completeness we ought to have explored options other than the two (one?) that we did, and had we more time we may have done so. That said, my mate viewed this very much as an accept/decline dilemma (precluding other options) because he had only a day to make a decision. Clearly, in view of what happened, my argument about not having enough time is a complete cop out: we should have made the time to explore the options because it is precisely what had come back to bite us. In hindsight it’s all very well to say that we could have done this or should have done that. The question is: how could we have given ourselves the best possible chance to have foreseen the eventuality that occurred (and others ones that didn’t)? One way to do this is to explore other ideas in response to the root question: what should I do? (see Figure1). However, it can be difficult for the person(s) facing the dilemma to come up with new ideas when one option looms so much larger than all others. It is the facilitator’s job to help the group come up with options when this happens, and I had clearly failed on this count. Sure, it can be difficult to come up with options out of the blue – especially when one is not familiar with the context and background of the problem. This highlights the importance of getting a feel for things before the discussion starts. In this case, I should have probed my friends current work situation, how he was regarded at his workplace and his motivations for moving before starting with the map. However, even had I done so, it is moot whether we would have foreseen the particular consequence that occurred. So, is there any way to get participants thinking about consequences of their choices? Remember, in IBIS one “evaluates” an idea in terms of its pros and cons. Such an analysis may not include consequences . Figure 2 illustrates how this might have worked in the case of my friend’s dilemma. Had we brainstormed the consequences of accepting, he may well have come up with the possibility that actually eventuated. 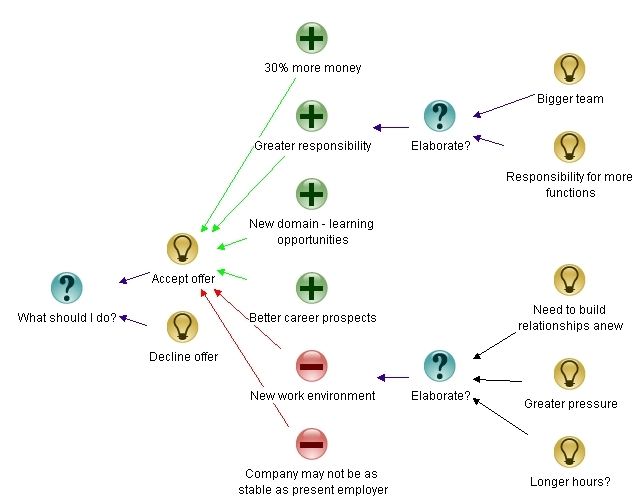 The branch highlighted in yellow shows how we might have explored the consequences of accepting the job. For each consequence one could then consider how one might respond to it. The exploration of responses could be done on the same map or hived off into its own map as I’ve shown in the figure. Note that clicking on a map node in Compendium (the free software tool used to create IBIS maps) simply opens up a new map. Such sub-maps offer a convenient way to organise complex discussions into relatively self-contained subtopics. I emphasise that the above is largely a reframing of pros and cons: all the listed consequences can be viewed as pros or cons (depending on whether the consequence is perceived as a negative or a positive one). However asking for consequences explicitly prompts participants to think in terms of what could happen, not just known pros and cons. Of course, there is no guarantee that this process would have enabled us to foresee the situation that actually occurred. This deceptively simple dilemma is indeed wicked. With wicked problems…. any solution, after being implemented, will generate waves of consequences over an extended–virtually an unbounded– period of time. Moreover, the next day’s consequences of the solution may yield utterly undesirable repercussions which outweigh the intended advantages or the advantages accomplished hitherto. In such cases, one would have been better off if the plan had never been carried out. The full consequences cannot be appraised until the waves of repercussions have completely run out, and we have no way of tracing all the waves through all the affected lives ahead of time or within a limited time span. I can’t hope to put it any better than that. Last weekend I met up with a friend I hadn’t seen for a while. He looked a bit preoccupied so I asked him what the matter was. It turned out he had been offered a job and was mulling over whether he should accept it or not. This dilemma is fairly representative of some of the tricky personal decisions that we are required to make at various junctures in our lives: there’s never enough information to be absolutely certain about the right course of action, and turning to others for advice isn’t particularly helpful because their priorities and motivations are likely differ from ours. It is a one-shot operation. Since one can make only one choice, one has no opportunity to test the correctness of ones choice. The choice one makes (the solution) depends on which aspects of the two choices one focuses on (i.e. the solution depends on ones explanation of the issue). Admittedly, there are some characteristics of wickedness that the job dilemma does not satisfy. For example, the problem has a definitive formulation (specified by the choices) and there are an enumerable number of choices (accept or decline). Nevertheless, since it satisfies five criteria, one can deem the problem as being wicked. No doubt, those who have grappled with this question in real life will probably agree. Horst Rittel, the man who coined the term wicked problem also invented the Issue-based Information System (IBIS) notation to document and manage such problems (note that I don’t use the word “solve” because such problems can’t be solved in the conventional sense). The notation is very easy to learn because it has just three elements and a simple grammar – see this post for a quick introduction. Having used IBIS to resolve work related issues before (see this post, for example), I thought it might help my friend if we could used it to visualize his problem and options. So, as we discussed the problem, I did a pencil and paper IBIS map of the issue (I didn’t have my computer handy at the time). In the remainder of this post, I reconstruct the map based on my recollection of the conversation. What should I do (regarding the job offer)? Questions are represented by blue-green question marks in IBIS (see Figure 1). There are two possible responses to the question– accept or decline. Responses are referred to as ideas in IBIS, and are denoted by yellow lightbulbs. The root question and the two ideas responding to it are shown in Figure 1. An IBIS map starts with the root questions and develops towards the right as the discussion progresses. The next step is to formulate arguments for and against each idea. These are referred to as pros and cons in IBIS, and are denoted by a green + and red – sign respectively (See Figures 2 and 3 for examples of these). Greater responsibility compared to current job. These points have been depicted in Figure 2. I felt the second point needed clarification, so I asked him to elaborate on what he meant by “Greater responsibility.” Now, any node in IBIS can be elaborated by asking appropriate questions and responding to them. He mentioned that he would be managing a bigger team which was responsible for a wider range of functions. I broke these up into two points elaborating on the “greater responsibility” point. The elaborations are on the extreme right in Figure 2. “Do you see any downside to taking the job?” I asked. 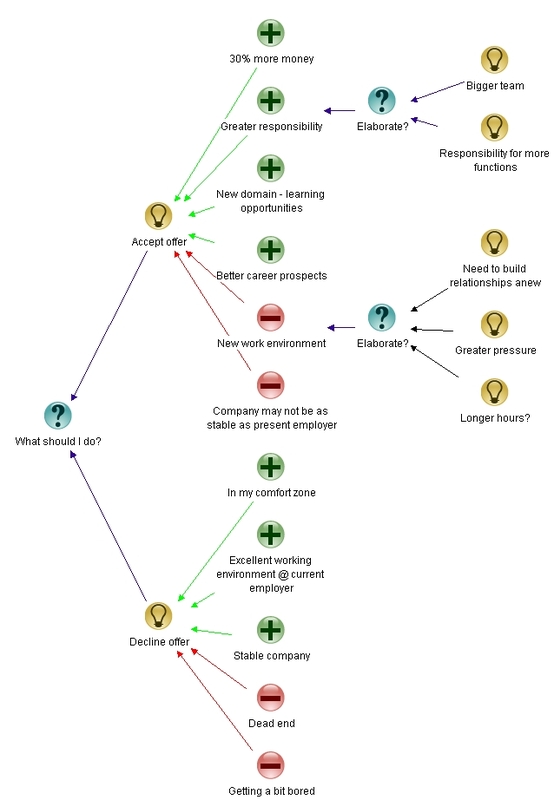 I mapped these points with “New working environment” as the main point and the others as elaborations of it. I then asked him if there were any other cons he could think of. The map at this stage is shown in Figure 3. He seemed to be done with the “accept” option, so I suggested moving on to outlining arguments for and against staying with his present employer. He was in his comfort zone – he knew what was expected of him and was able to deliver it with ease. The working environment in his company was excellent. The company was doing very well and the outlook for the foreseeable future was good. No prospects for career advancement; the job was a dead end. After five odd years, he was getting a bit bored. The map at this stage is shown in Figure 4. I asked him if the analysis thus far suggested a choice. “No,” he said shaking his head. To make progress, I suggested looking at the cons for both options, to see if these could be mitigated in some way. We looked at the “stay with the current employer option” – there was really nothing that could be done about the issue of career stagnation or the fact that the work was routine. The company couldn’t create a new position just for him, and the work was all routine because he had done it for so long. Finally, we turned our attention to the cons of the “move to the new employer” option. “I think things are a lot clearer now,” he said as I added the points we’d just discussed to the map. Figure 5 shows the final result of our deliberations. A few days later he called to tell me that he had accepted the job, but only after satisfying himself that the company was sound. He had to rely on information that he found on the web because no one in his network of accquaintances knew anything about the company. But that’s OK, he said – absolute certainty is impossible when dealing with life’s little dilemmas. Management schools and gurus tell us that specific managerial actions will lead to desirable consequences – witness the prescriptions for success in books such as Good to Great or In Search of Excellence. But can one really attribute success (or failure) to specific actions? A cause-effect relationship is often assumed, but in reality the causal connection between strategic management actions and organisational outcomes is tenuous. 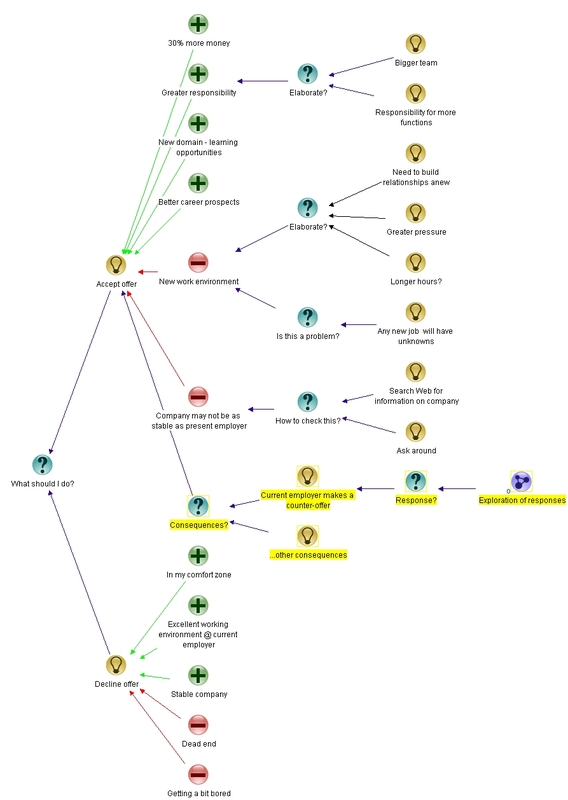 This post, based on a paper by Glenn Shafer entitled Causality and Responsibility, is an exploration of the causal connection between managerial actions and their (assumed) consequences. Note that the discussion below applies to strategic – or “big picture” – management decisions, not operational ones. In the latter, cause and effect is generally quite clear cut. For example, the decision to initiate a project sets in motion several processes that have fairly predictable outcomes. However, taking a big picture view, initiating a project (or even the successful completion of one) does not imply that the strategic aims of the project will be met. It is the latter point that is of interest here – the causal connection between a strategic decision and its assumed outcome. Shafer’s paper deals with causality and responsibility in legal deliberations: specifically, the process by which judges and juries reach their verdict as to whether the accused (person or entity) is actually responsible (in a causal sense) for the outcome they are charged with. In short, did the actions of the accused cause the outcome? The arguments Shafer makes are quite general, and have applicability to any discipline. In the following paragraphs I’ll look at a couple of the key points he makes and outline their implications for cause and effect in management actions. …we are on safe ground in attributing responsibility if we do so based on our knowledge of impossibilities. It is not surprising, therefore, that the classical legal concept of cause – necessary and sufficient cause – is defined in terms of impossibility. According to this concept, an action causes an event if the event must happen (it is impossible for it not to happen) when the action is taken and cannot happen (it is impossible for it to happen) if the action is not taken. This is, in fact, what legal arguments attempt to do: they attempt to prove, beyond reasonable doubt, that the crime occurred because of the defendants actions. The reason that impossibilities are a better way of “proving” causal relationships is that such relationships cannot be invalidated as our knowledge of the situation increases providing the knowledge that we already have is valid. In other words, once something is deemed impossible (using valid knowledge) then it remains so even if we get to know more about the situation. In contrast, if something is deemed possible in the light of existing knowledge, it can be rendered false by a single contradictory fact. The outcome must (almost always) happen if the managerial action occurs. It is highly unlikely that the outcome could have occurred without the action occurring prior to it. Seen in this light, many of the prescriptions laid out in management bestsellers are little better than herpetological oleum. Of course, deterministic cause-effect relationships aren’t the norm in management – only the supremely confident (foolhardy?) would claim that a specific managerial action will always lead to a specific organisational outcome. This begs the question: what about probabilistic relationships? That is, what can we say about claims that a particular action results in a particular effect, but only in a fraction of the instances in which the action occurs? We validate a system of probabilities empirically by performing statistical tests. Each such test checks whether observations have some overall property that the system says they are practically certain to have. It checks, in other words, on whether observations diverge from the probabilistic model in a way that the model says is practically (approximately) impossible. In Probability and Finance: It’s Only a Game, Vovk and I argue that both the applications of probability and the classical limit theorems (the law of large numbers, the central limit theorem, etc.) can be most clearly understood and most elegantly explained if we treat these asserted practical impossibilities as the basic meaning of a probabilistic or statistical model, from which all other mathematical and practical conclusions are to be derived. I cannot go further into the argument of the book here, but I do want to emphasize one of its consequences: because the empirical validity of a system of probabilities involves only the approximate impossibilities it implies, it is only these approximate impossibilities that we should expect to see preserved in a deeper causal structure. Other probabilities, those not close to zero or one, may not be preserved and hence cannot claim the causal status. The particular customer may differ in important ways from those used in estimating the probability.This is a manifestation of the reference class problem. Most statistical studies of the kind used in marketing or management studies are enumerative, not analytical – i.e they can be used to classify data, but not to establish cause-effect relationships. See my post entitled Enumeration or Analysis for more onthe differences between enumerative and analytical studies. There is an underlying reason for the above which I’ll discuss next. …a cause ought to increase the frequency of its effect. But this fact may not show up in the probabilities if other causes are at work. Background correlations between the purported cause and other causal factors may conceal the increase in probability which would otherwise appear. A simple example will illustrate. It is generally supposed that smoking causes heart disease. Thus, we may expect that the probability of heart disease on smoking is greater than otherwise (K’s note: i.e. the conditional probability of heart disease given that the person is a smoker, P(H/S), is greater than the probability of heart disease in the general population, P(H)). This expectation is mistaken, however. Even if it is true that smoking causes heart disease, the expected increase in probability will not appear if smoking is correlated with a sufficiently strong preventative, say exercising. To see why this is so, imagine that exercising is more effective at preventing heart disease than smoking at causing it. Then in any population where smoking and exercising are highly enough correlated, it can be true that P(H/S) = P(H), or even P(H/S) < P(H). For the population of smokers also contains a good many exercisers, and when the two are in combination, the exercising tends to dominate…. In the case of strategic outcomes, it is impossible to know all the factors involved. Moreover, the factors are often interdependent and subject to positive feedback (see my previous post for more on this). So the problem is even worse than implied by Cartwright’s example. The implications of the above can be summarised as follows: the efficacy of most strategic managerial actions is questionable because the probabilities involved in such claims are rarely close to zero or one. This shouldn’t be a surprise: most organisational outcomes are consequences of several factors acting in concert, many of which combine in unpredictable ways. Given this is unreasonable to expect that managerial actions will result in predictable organisational outcomes. That said, it is only natural to claim responsibility for desirable outcomes and shift the blame for undesirable ones, as it is to seek simplistic solutions to difficult organisational problems. Hence the insatiable market for management snake oil. To make matters worse, the factors are often interdependent (see my previous post for more on this).